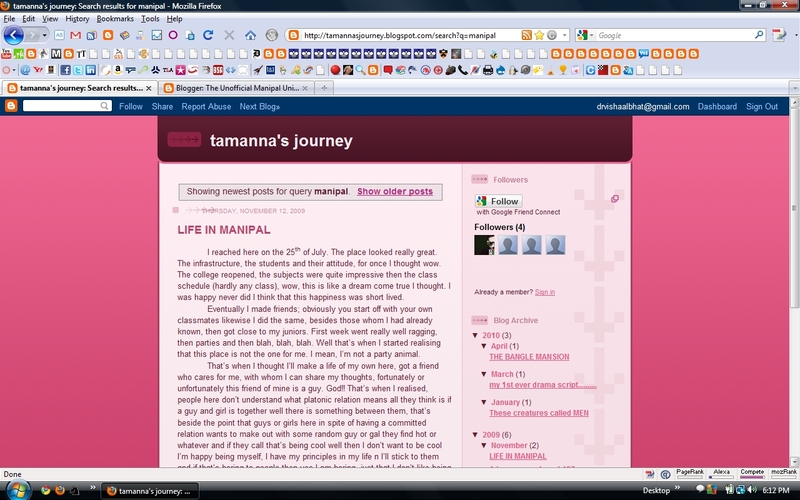 This article was first posted at tamanna’s journey. I reached here on the 25th of July. The place looked really great. The infrastructure, the students and their attitude, for once I thought wow. The college reopened, the subjects were quite impressive then the class schedule (hardly any class), wow, this is like a dream come true I thought. I was happy never did I think that this happiness was short lived. Eventually I made friends; obviously you start off with your own classmates likewise I did the same, besides those whom I had already known, then got close to my juniors. First week went really well ragging, then parties and then blah, blah, blah. Well that’s when I started realising that this place is not the one for me. I mean, I’m not a party animal. That’s when I thought I’ll make a life of my own here, got a friend who cares for me, with whom I can share my thoughts, fortunately or unfortunately this friend of mine is a guy. God!! That’s when I realised, people here don’t understand what platonic relation means all they think is if a guy and girl is together well there is something between them, that’s beside the point that guys or girls here in spite of having a committed relation wants to make out with some random guy or gal they find hot or whatever and if they call that’s being cool well then I don’t want to be cool I’m happy being myself, I have my principles in my life n I’ll stick to them and if that’s boring to people then yes I am boring, just that I don’t like being categorised amongst them. And the worst part is yet to come, the people who talk about you are none other than the one’s whom you consider as friends and the ones to whom you are kind of close to in class. Though here people portray themselves to be broad minded they are not, I don’t know what it is, is it jealousy or truly are they so narrow minded. After a point of time I started ignoring these things and started doing things I felt happy about, I thought enough that I have tried and kept others happy now it’s my time, well being happy for me is going for a walk o to the lake o to the beach with my friend and just spending time talking about each other’s life, teasing each other, then little bit I bore him telling about the man in my life. I have a friend who lends me a shoulder to cry, who wipes my tears when I cry, who pecks me when I need some pampering, who hugs me when I miss home, who cares for me, who is always there for me but then its not the same as the people i need in my life are missing,. A curry without spices is exactly how my Life in Manipal is.